DAISEN WONDER introduces community-based and eco-friendly tours held in Tottori Prefecture of Japan. Tottori Prefecture is in the western Japan facing Japan Sea. It takes an hour and a half from Tokyo. Six flights operate per day. It takes an hour and a half from Incheon International Airport, Seoul. Asiana Airlines operate three flights a week on Tuesday, Wednesday and Sunday. Since 2009, DBS Cruise Ferry sails between Vladivostok, Russia, to Donghae, Korea, and to Sakaiminato, Tottori. Tottori serves a gateway to Japan. Please check Access page for more information. Mt. Daisen is a volcanic mountain located in Tottori Prefecture, Chugoku Region of Japan. It is the highest in the Chugoku region with an elevation of 1,729 meters. The name Daisen (大山) means "big mountain". Mt. 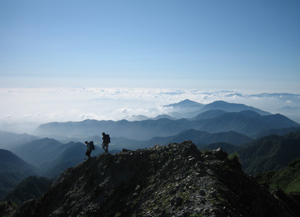 Daisen has been chosen as the third greatest summits in Japan behind Mt. Fuji and Mt. Yari (Yarigatake) at "The Japanese Greatest Summits Ranking" held by Japan's national public broadcasting organization (NHK). The number of climbers in August 2010 was 11,900. Daisen has been regarded as a god itself since the ancient Yayoi eras, and one of the most important mountain for Japanese Shugendo. Climbing the mountain used to be severely prohibited until the Edo period. As a result, Mt. Daisen boasts the largest beech forest in western Japan. What Kind of tour programs do we offer? We offer cycling, kayaking, hiking, mountain climbing, snowshoeing, skiing and more outdoor activities. Please see a list of tours at Tours page. 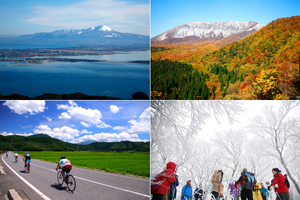 What is International Ecotourism Conference 2013 in Tottori? We are proud to announce that International Ecotourism Conference 2013 in Tottori will be held from October 19th to 21st, 2013, in Tottori Prefecture. Please see International Ecotourism Conference 2013 in Tottori page for details.